I've been knotting, tons of simple knots not flipped, not the same knot we use in tatting. 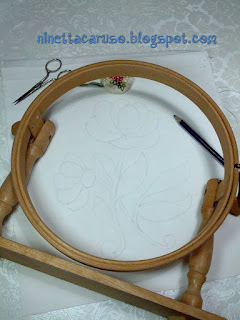 That is my feeling, it is a different knot, even if I discovered that the shuttle is very useful to hold the thread. So the same or similar tool, the shuttle, but also the movement is different, now I have my right hand a little cramped and the left wrist tired... I'll soon be back tatting! I've used three moulinè stranded embroidery skeins, wound together. About the fabric, there is quite a story to tell: it is pure cotton (I think) and I was told that it was from a parachute, picked up after the second war by my granny and her mother in law, cleaned and reused for clothes, sheets and tablecloths. UPDATE: My granny is 97yo, she's deaf but lucid and I could ask her, she remembers well that parachutes and confirmed they were pure silk. 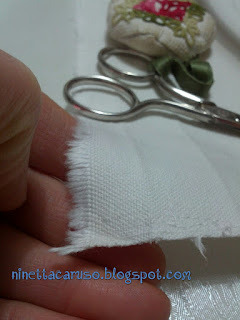 The fabric described in this post is pure cotton. They used to live near the parachuting school based at the military airport, and she used to sew for her family, also reusing other discarded wwii paratroopers' fabric and other generic military fabric. This is fascinating,I wonder if in that painting with that queen looking lady with a rather giant shuttle if she was doing this and not tatting? What do you think? Do you know the painting? Yes, I think she's knotting. 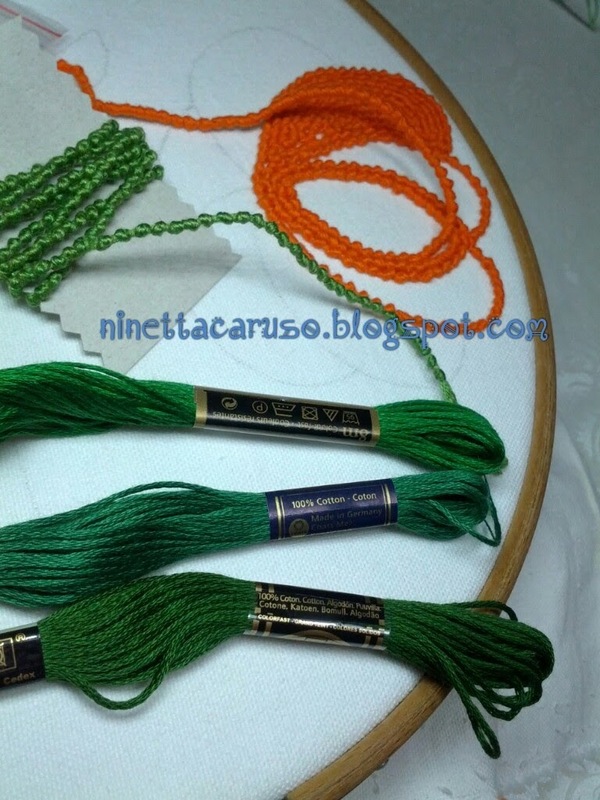 Yes, knotting was a very popular passtime in the 16th and 17th centuries, and very fancy, quite large shuttles with open tips were used to carry the unworked thread, while beautiful little bags hanging from the wrist recieved the knotted thread. It is thought that this is one of the precursors to modern tatting, which has not been clearly documented before around 1850. Great recycling, it will be very special. I like e the used parachute story! The knots are fascinating too. 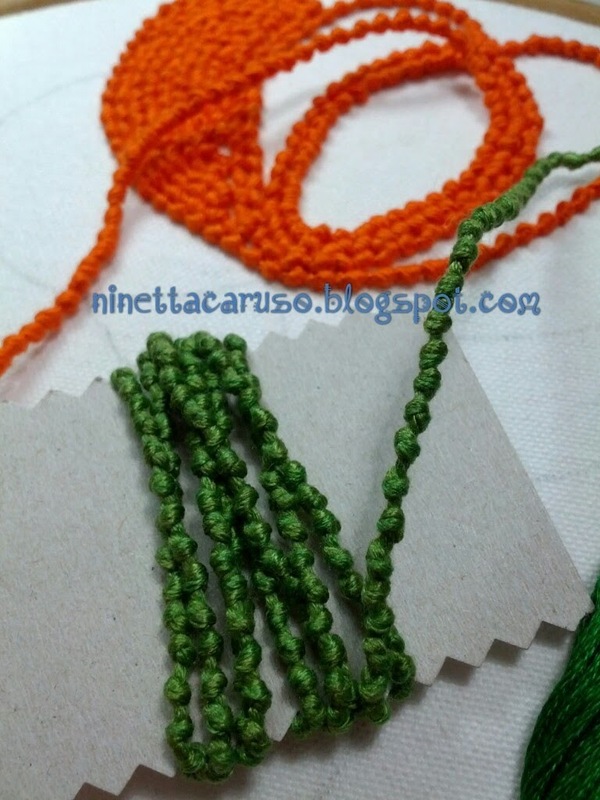 Do you accidentally tat when knotting? Ninetta, are you familiar with the "burn test"? If you pull a few small threads from the cut edge of your fabric and burn them, you should be able to tell if it is cotton (it will smell like burnt wood) or silk (it will smell like burnt hair), which are the most likely fibres for a WWII parachute. Later on, nylon was used, and that will melt. Ty very much, Kathleen, yes I knew that, in fact that's why I'm quite sure it is cotton. I still have my granny, 97yo, I could ask her again,she remember well that parachutes were pure silk and she sewed a lot, also reusing other discarded wwii paratroopers fabric.